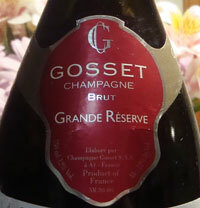 Gosset is a small traditional Champagne house located in Aÿ that produces very dry and full bodied wines that age well. The wines are partially aged in small oak casks and go very well with food. It's an "under the radar" Champagne house producing some great Champagnes at relatively reasonable prices. In 1584 Pierre Gosset started making still wines from grapes from his own vines in Aÿ. In the 18th Century, the Gosset family started producing sparkling wines. The house was sold to the Cointreau family in 1994, and although the headquarters moved to Epernay, very little else changed. They now produce about a 120,000 bottles a year of Champagne, which makes them a pretty small Champagne House. Gosset Champagnes, other than their fairly simple entry level Brut Excellence, are not surprising often compared to Krug, and although I find them somewhat similar in style I (no surprise) greatly prefer Krug, although it's over twice the price. If you like big, dry, traditionally styled Champagne you owe it to yourself to try Gosset. Wines are harvested by hand and only the first pressing of juice is used. Grapes from each village are pressed and fermented separately in small vats prior to blending. All their grapes are Premier and Grand Cru and come from the Marne region (where Aÿ and Epernay are located), there is no malolactic fermentation, and the large bottles (magnums and bigger) are still hand riddled. While their Web site says their wines are made of Chardonnay, Pinot Noir, and Pinot Meunier, although they supposedly also include a small amount of Arbanne, Fromenteau (Pinot Gris), and Petit Meslier (ancient Champagne grape varieties of which only a small amount still exist) in some of their wines which may explain some of their personality. Brut Excellence is a festive yet fairly simple and light bodied Champagne that makes a great aperitif. It's not really in the Gosset style, but is pleasant enough and perhaps a good Champagne to give a glass to your 16 year old niece or share with your 18 year old paramour, if allowable by local custom and regulations. Fruity (pear is often mentioned), a bit yeasty, with notes of pain grille (which really means "toast"). 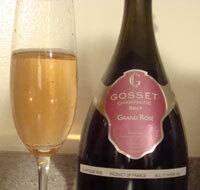 NV (Non-Vintage) Grand Reserve Brut is squarely in the Gosset style: dry, full bodied, and complex. It accompanies food and ages well, and if you can find it is often a bargain. It might seem expensive for a NV, but may claim it's worth it. I'm enjoying a glass as I type this! Tasting note below. (NV) Grand Rose - It's elegant, almost delicate and makes a fine apertif. It's a salmon pink color and tastes of strawberries, dried cherries and creamy mousse. Quite long and minerally on the finish. Some consider it a very serious rose, critic Robert Parker states "Frankly, a touch more sweetness might not be a bad thing," and in my one serious encounter (a bottle over an evening as opposed to a glass at a party or a partial glass at a tasting) I found it to be somewhat simple yet delicious. Tasting note below. Grand Millesime Brut is Gosset's vintage Champagne, and the Celebris Brut is one step up and their prestige cuvée. There is also a Celebris Brut Rose and Celebris Brut Rose Blanc de Blancs although they are quite rare and I've never even seen a bottle. Gosset Champagne is not very well known nor widely available, but other than their simple Brut Excellence this is Champagne worth searching out and experiencing, especially if you love big, dry, traditionally styled Champagne like Krug. Many Champagne aficionados absolutely love it, so you should find out for yourself! I look forward to trying their Vintage and Celebris cuvees. An immediately interestingly nose of lemon curd and cavernous chalk. Quite brisk on the palate with red apple initially and some distinct lime and chalk in the background. The lime becomes more prominent with time, and this has the backbone to standup to some significant food. Almost creamy but very dry and crisp. An intriguing color, primarily amber with a significant pink tone as well. On the palate this tastes quite fresh with mixed red berries. Strawberries and Raspberries and more. Quite big and long. Very round and mouthfilling. Spiciness as it warms. I like this quite a bit, but it is on the simple side. Entirely enjoyable but not very complex.